Growing up surrounded by music and exposed to the Spanish music scene, Kevin Silva grew from disliking music to having a passion for it. At the age of 12 Kevin picked up his first instrument, the guitar. Despite the fact that he was self taught, he continued to spend countless hours trying to learn what he could with the resources he had available to him. Kevin didn't get proper teaching in music until he picked up the violin in his early years of high school. Kevin attended West Adams Preparatory High School. 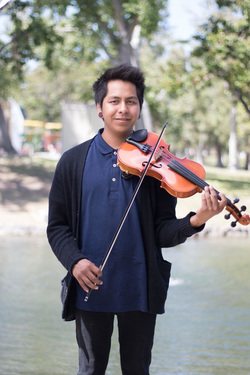 For the majority of the time he attended high school, Kevin became fully invested with music through the violin and the school's orchestra. In 2011 he played at the Hollywood Bowl with the West Adams Prep and James A. Foshay Orchestra. It was during that performance he realized that music performance was the route he wanted pursue as a career. The following year Kevin joined Los Angeles Youth Orchestra (YOLA). As a member of YOLA, he played at several large concert venues including the Walt Disney Concert Hall. Kevin then moved on to attend Santa Monica College (SMC) and quickly joined the Santa Monica College Symphony Orchestra. For the next three years Kevin continued to perform with the Santa Monica College Symphony Orchestra and continued to pursue his musical studies at SMC. He soon started to help teach Santa Monica Youth Orchestra (SMYO) as well as provided assistance with their performances. After a meaningful amount of time of performing with orchestras, he decided to create his own identity with music. Kevin currently now teaches music through the guitar and violin. He also started to create his own music to fulfill his need of creating a musical identity.